This is the sixth of a series of posts discussing how to get Google Glass Mirror (Java) and GDK projects set up in various IDEs. 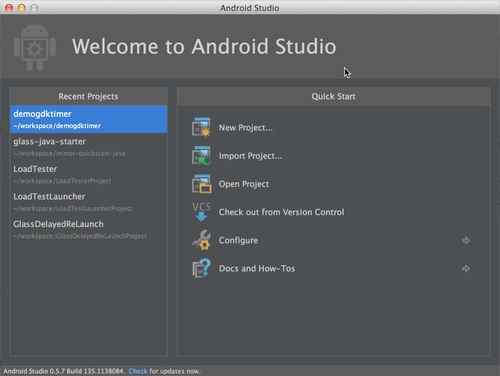 This post will cover importing the Java Mirror Quick Start project into Android Studio. 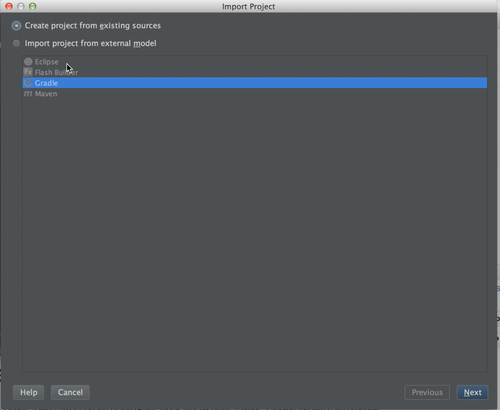 In Android Studio, select Import Project. This is the fifth of a series of posts discussing how to get Google Glass Mirror (Java) and GDK projects set up in various IDEs. 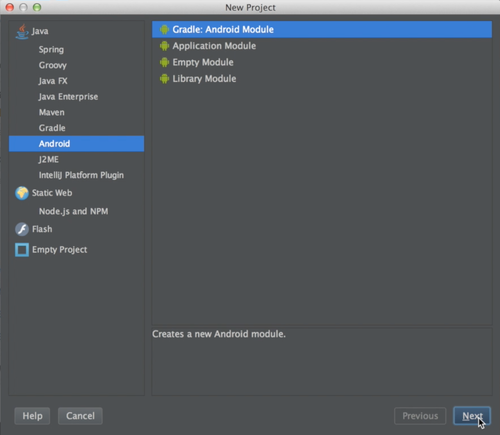 This post will cover importing a Gradle GDK project into Android Studio. 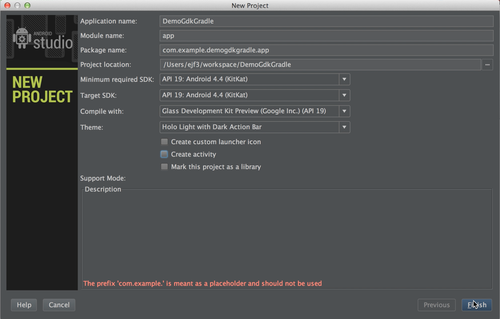 Import the GDK project as a module, and it will automatically be placed in the correct spot, and the Gradle configuration handled correctly. No reason to keep it around now. 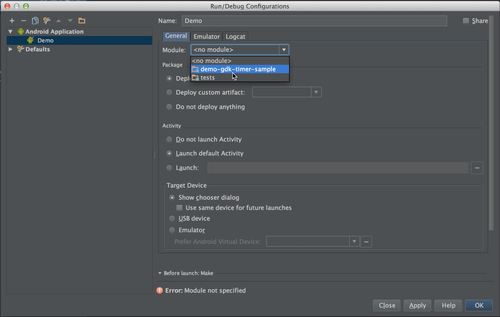 Need to have one Activity that is considered the launch Activity, otherwise IntelliJ won’t let you run. This is the fourth of a series of posts discussing how to get Google Glass Mirror (Java) and GDK projects set up in various IDEs. 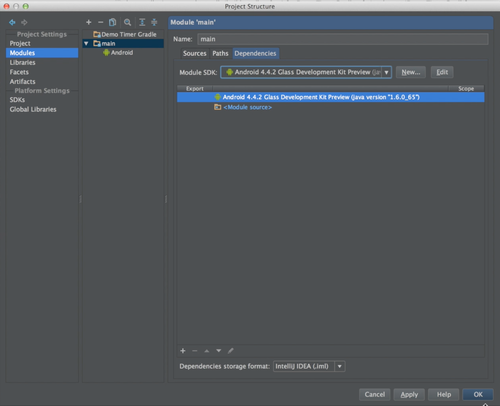 This post will cover importing the Java Mirror Quick Start project into IntelliJ. 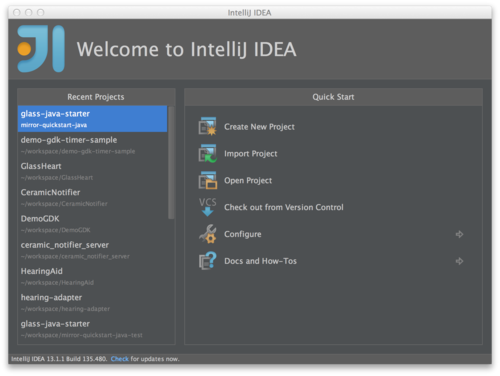 In IntelliJ, select Import Project. This is the third of a series of posts discussing how to get Google Glass Mirror (Java) and GDK projects set up in various IDEs. 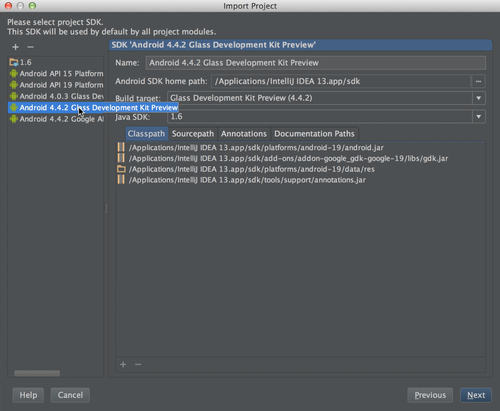 This post will cover importing a Gradle GDK project into IntelliJ. 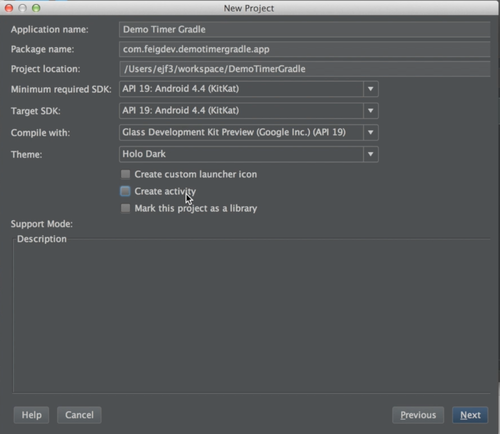 In IntelliJ, select Create New Project. Set all of them to 19, and the ‘Compile with’ to GDK Preview 19. Now, we’re going to import the project that we want to work with. Make sure to select the project here. 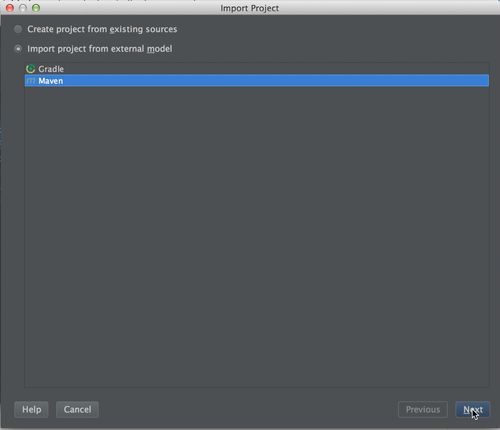 Do not import it as an Eclipse, Gradle or Maven project. 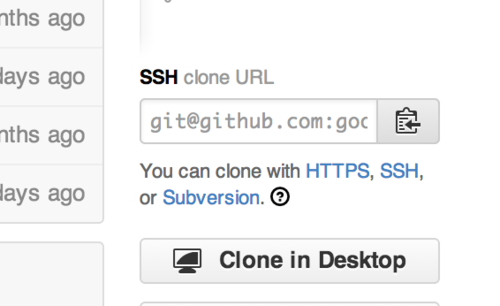 This should fix the build.gradle file, you should see it go from red to white (or black). Now, you can also delete the dummy module that’s in there already. Go back into the Module Settings, then select our imported module, and the 'Dependencies’ tab. From the drop-down, pick GDK 19. This is the second of a series of posts discussing how to get Google Glass Mirror (Java) and GDK projects set up in various IDEs. 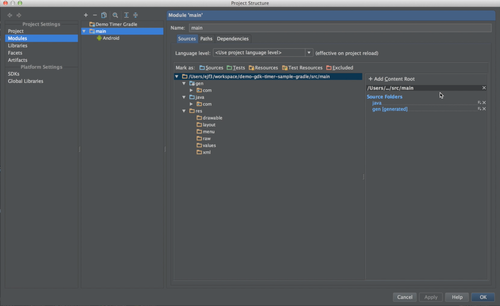 This post will cover importing a legacy style GDK project into IntelliJ. Until you get to the Project SDK screen. Then 'Finish’ to create the project. This is the first of a series of posts discussing how to get Google Glass Mirror (Java) and GDK projects set up in various IDEs. 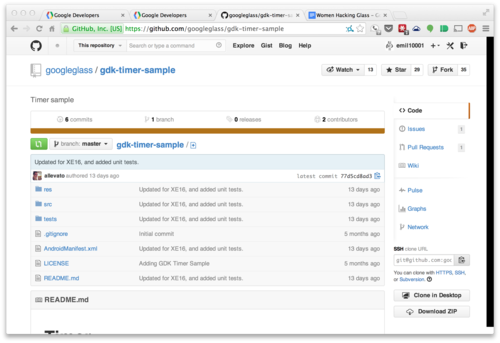 This first post will simply cover pulling down a project from GitHub. That’s it! You’re all set! Last night, I received an interesting email from Ajay Kohli. I met Ajay at the CodeChix Glass workshop back in February. He’s a Med Student, working at Kaiser, as well as a Glass Explorer. When I met him, he was very excited about the possibilities for using Glass in hospitals to assist physicians with all sorts of things, in particular during surgery. Anyways, his email mentioned that he was working with a cochlea surgeon, and they were discussing a rather interesting application for Google Glass. Apparently, bone conduction is a viable method to enable some people with hearing loss to hear, and there is currently a class of hearing aids that uses bone conduction. 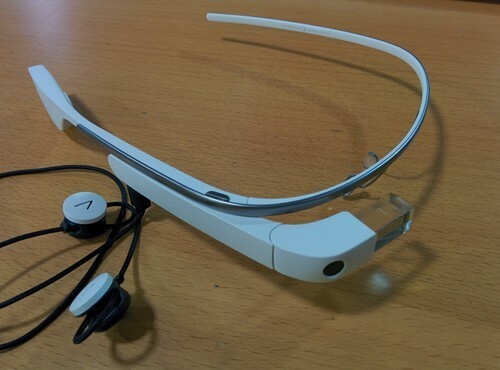 What’s interesting is that Google Glass uses bone conduction with its built-in speaker. Ajay was wondering if I knew of any Glassware or source code that could enable Glass to be used as a hearing aid. You can check out the full project, and download the apk to try it out for yourself on GitHub. David Callaway had his father, who is hard of hearing and uses hearing aids, test this out. According to him, it actually works! We did a functional gain test (hearing test with and without the glass on) yesterday on a bilateral mild conductive hearing loss. No significant improvement in hearing with the glass. We did a unilateral conductive hearing loss speech in noise test. No major improvement with glass as well. 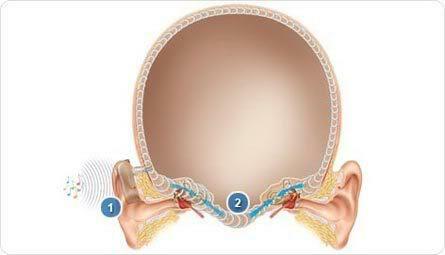 At this point the limitations for glass as a hearing assistance device seem to be 1) available power (gain of making the bone conductor vibrate as fast as possible) and 2) possible processing power, if that processed speech cannot catch up to the live stimulus. So in a controlled audiology setting, these variables would have to be addressed to achieve hearing aid potential for glass. I recently ran a workshop at Andreessen Horowitz, which was an introduction to Google Glass. It was a lot of fun, so I figured that I would create a screencast out of the content. This is the second of two posts on the subject. This one is discussing the Mirror API Java Quick Start. Part 1 may be found here. I recently ran a workshop at Andreessen Horowitz, which was an introduction to Google Glass. It was a lot of fun, so I figured that I would create a screencast out of the content. This is the first of two posts on the subject. This one is discussing the Mirror API at a high level. Part 2 may be found here. … or any other smart wearable? On top of that, one third of early wearable adopters have stopped wearing them already. What’s going on here, I thought that wearables were going to be the next big thing? They are, but we’re not there yet. Right now, we are at the beginning. It doesn’t surprise me at all that wearables are not proving useful enough to use on a daily basis, the truth is they’re not useful enough yet. What’s more, the article discussing the decline in use was looking at activity tracking devices. It doesn’t surprise me that people might lose interest in activity tracking after doing it for a few months and not seeing much improvement. I don’t log into my Basis dashboard very often these days, though I do wear the device daily. Regardless, I think that it is more useful if we focus on smart wearables, and specifically Glass here. Let’s have a brief history lesson. Consider the case of smartphones, when they were popularized several years ago. When Android launched, standalone GPS units were relatively expensive, and the iPhone didn’t have a decent navigation solution. Android came onto the scene and provided a really, incredibly useful app, Maps, which included real-time navigation. (Actually, I don’t remember exactly if Maps provided this out of the gate, but I do remember buying a standalone GPS app on Android, where you could download cached maps for $30 on my G1.) Both products also opened the door to over-the-top messaging and calling products that have driven prices for those services down across the board. Both platforms also opened up new markets for casual gaming, which barely existed before. They allowed you to read the news on the train without needing to buy a newspaper. There are countless other things that smartphones are doing these days that people really wouldn’t want to live without. That said, it took time for people to realize these use cases, and to begin to rely on their phones more and more. The performance out of the gate with the G1, and I assume the original iPhone, left a lot to be desired. The hardware limitations made it difficult to imagine a world where we have more people coming online for the first time with mobile phones than computers. I had an idea that they could be that useful, but until recently, I hadn’t seen a compelling enough combination of hardware and software to get me to reach for my phone over my laptop (or even my tablet). Glass (and other smart wearable platforms) will have to get over the same hump. Frustrations with Glass are not failures, they are opportunities. It’s true that Glass doesn’t have any/enough killer apps yet. There are a handful of cool apps for Glass, LynxFit, WinkFeed, Shard, my app Ceramic Notifier, and of course the camera, Google+, Hangouts, Google Now, and Gmail. For Glass to be a good value proposition to consumers, there need to be at least a few things that you can do with Glass that you simply could not do without it. It will probably be at least a couple of years before we’ve had enough time to build out the ecosystems for these platforms, and to even think about what these killer apps might be. The truth is that these new wearable platforms are very different from smartphones. They may run similar software stacks, but people interact with them completely differently. What I’m trying to get out of the Explorer program is to learn what these behaviors are going to look like. I want to understand this new paradigm from the perspective of the user, along with all the frustrations. Why buy Google Glass, or other smart wearables right now? My answer is if you’re a developer, looking for a billion dollar opportunity, this is the space to be in. Otherwise, wait a little bit. Smart wearables still be there in six months or a year, and they’ll be better.